These are the free sunflowers! I put them in a ceramic teapot that belongs to Leigh. I have painted this teapot before in a still life. Since I have been posting work on this blog since 2006 it is always fun to go back and see how my work has changed and improved(or not). You can see an earlier version of this teapot HERE and again HERE. 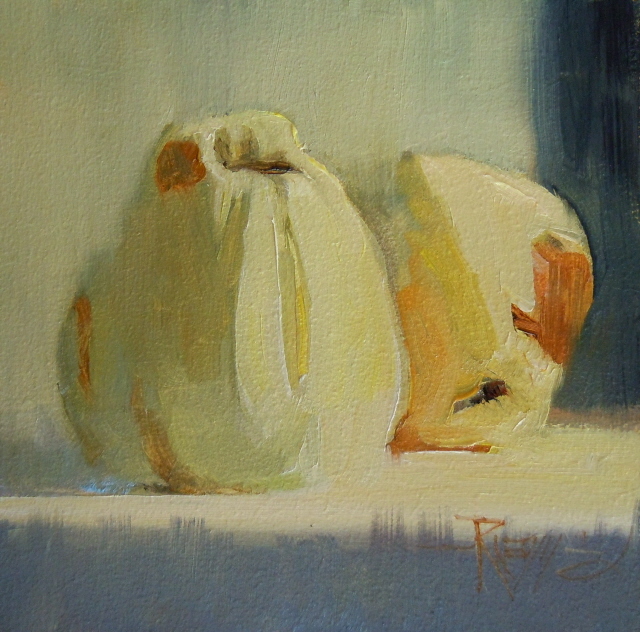 All of these small still life paintings will be on display and for sale at Arts in the Woods Studio Tour this year. You can see the new website for the Cultural Arts Foundation HERE. All of the information you need about Arts in the Woods is on this site and all of the artists too. I picked this sunflower out of Leigh's garden. 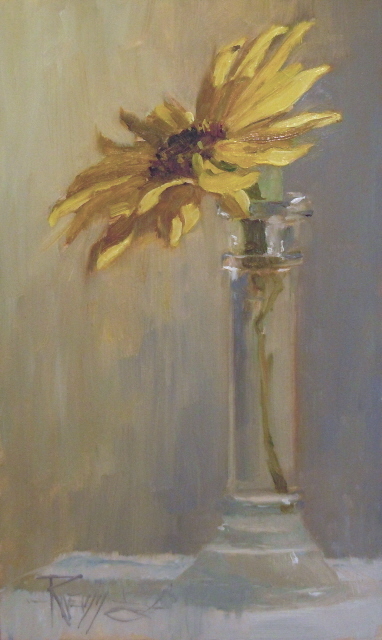 It was the last one left with all the petals...I had trouble getting the brilliant color but think I achieved a sensitive mood.....Hopefully. Enjoy! 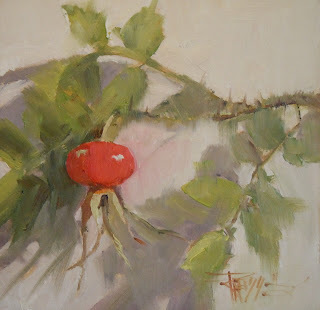 "Rose Hip" oil still life painting. There is a great grocery store near us called Central Market. In the parking lot they have a lot of Regosa Roses which produce these wonderful Rose Hips. I cut a few off for painting and then went in to see if they had any good Sunflowers...They were right at the end of the season and getting rid of the leftovers....so they gave me a few for free!....Double score! 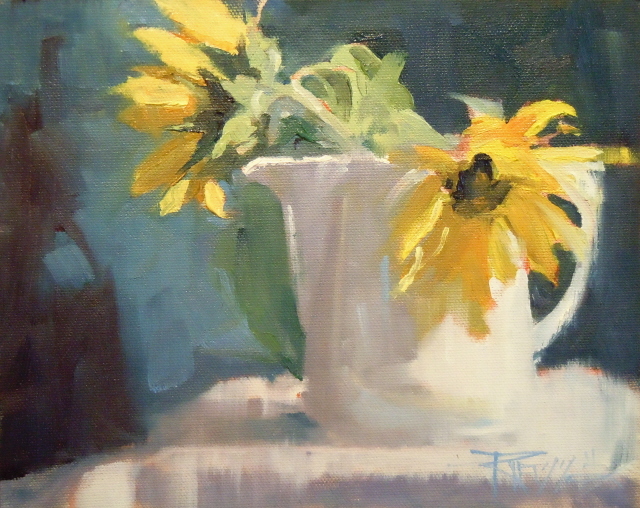 I wasn't happy with this until I softened all the edges except for the focal point. These are the huckleberries I have been making the pies from! Mix with apples and you have a real treat! 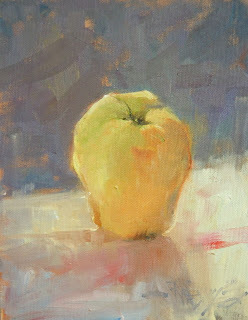 There is so much great fruit this year, Wish I could store it all....as it is, our freezer is stuffed with bags of apple slices! For some reason these two apples give me a sense of intimacy....but your right....apples can't be intimate...but they can be great in a pie! And these are! 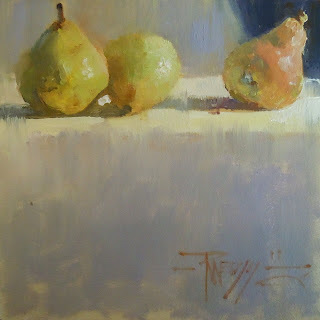 "Three's a Crowd" pear, still life oil painting. It's been awhile since I set up to do a series of still life paintings. I'm having fun with it! The challenge is to push myself creating three dimensions using temperature and edges. 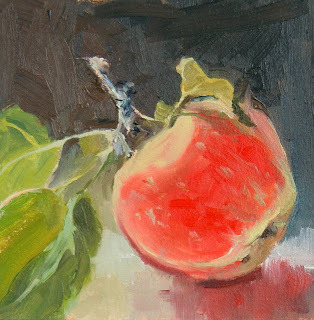 Okay, ...This post starts a series of small still life paintings I have been rendering from life in the studio. 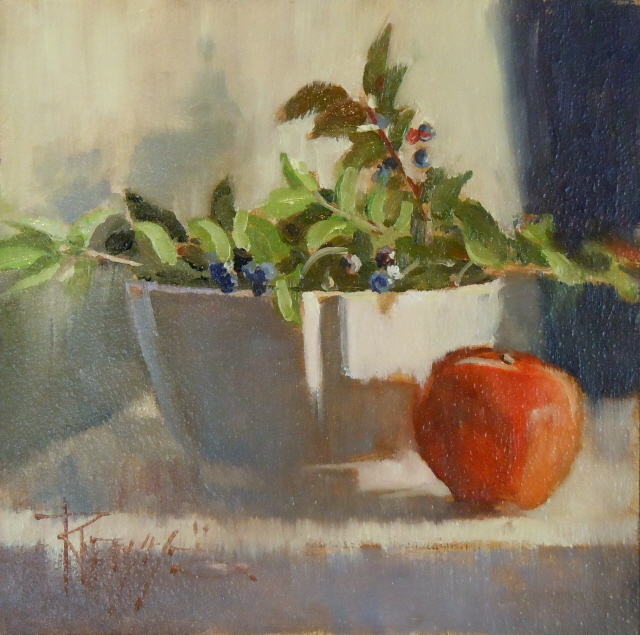 Most of them are 6x6 studies of the fall fruit, berries and flowers found in the fields right around the Knowles Studio.I love this time of year and recently, for the first time,...have been making pies from the apples and huckleberries that are abundant this year. They tell me this is a Yellow Transparent. Delicious in a pie!! I walk by here a lot when I am in Seattle. It's just a little way down from where the ferry lets you off at Coleman dock if you are coming over from Bainbridge Island or Bremerton. Both of these boats do tour cruises. 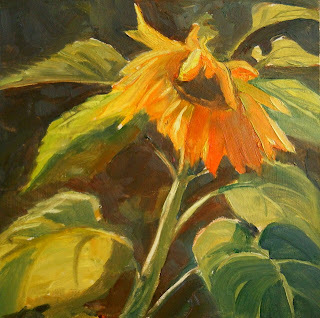 This painting will be on display for the Arts in the woods Studio Tour in Poulsbo coming up November 11th, 12th and 13th . Stop by if you are in the area! The Knowles Studio will be decked out with exciting new artwork! 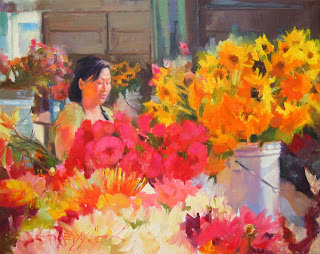 "The Flower Vendor 2011" figurative, floral , oil painting, Seattle city scenes. It seems like every time someone sees this painting they say "I know that girl"! This is a familiar face and a familiar scene at the Pike Place Market in Seattle. The flower stalls at the market and the folks who create the bouquets are irresistible to me as an artist! I have painted this same girl before but I think my technique is improving from many "brush hours" . 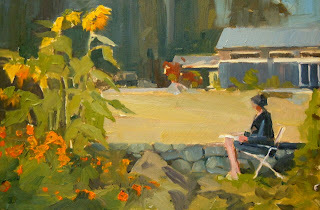 I am going to post a link to my last painting of this scene from 2007 (even though I am embarrassed to do it) just to show how much you can improve yourself by determination and practice(and prayer!). click here .....By the way, this is the same girl! I couldn't resist painting Leigh, painting the sunflowers! That's the studio behind her and the field all dry from the summer's hot days. 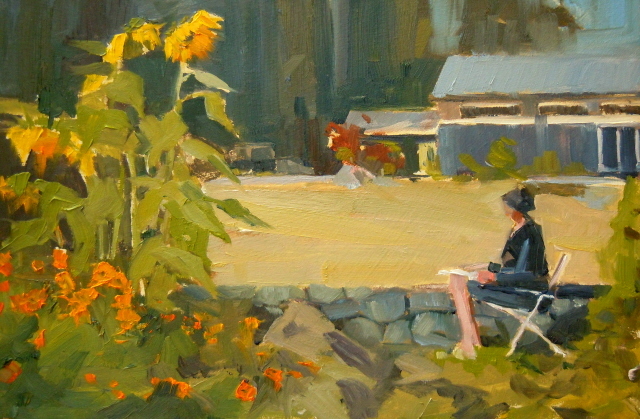 I took my student, Mike, out to Leigh's flower garden for some plein air painting. 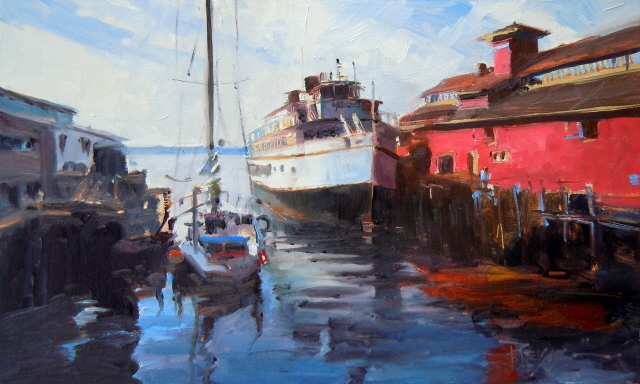 We were using the three color palette, Ultramarine Blue, Quin Red and Hansa Yellow. and creating a good design. If you live in the Northwest and would like to see the Knowles Studio for yourself, November would be a great time to do that! Arts in the Woods Studio Tour is always the second week in November. This year it falls on the 11th, 12th and 13th of November. The stunning Knowles Studio will be decked out with new and exciting art work for this three day event. I would love to see you there! "Main Street Gyros" Seattle city scenes. 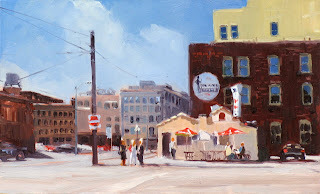 A great place to get some good grub! Surrounded by the tall buildings of Seattle and located next to the Comedy Underground is Main Street Gyros. It looks as if somebody dropped the place out of an airplane and it landed in the middle of the city!